“This Christmas Shrimp and I are hoping that enough people will “volunteer” a window to create a village Advent Calendar. This is not an idea thought up by us but one I had heard about in a Cambridgeshire village. 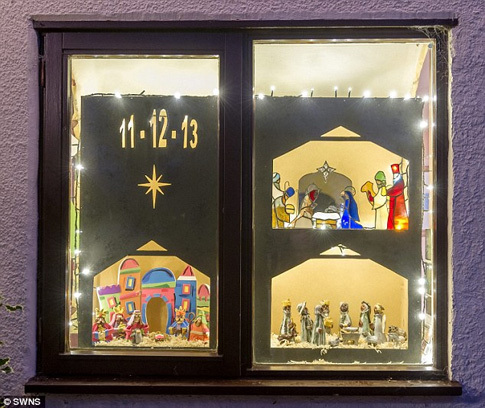 The idea is to have 25 houses with a window which is clearly visible from the road/pavement and that the window would have a simple (or highly decorated if wished) picture/scene similar to those depicted in an Advent Calendar. December 1st would be the first “opening” and I am thinking that this would be done when it gets dark and that we would manage to gather some onlookers to be there at the opening. We hope that we could get together sufficient offers for this Christmassy idea to go ahead. Dec 21st opening will be the Nativity Scene in the Church as part of the Carol Service at 3pm. Probably December 25th will be in the Church as well when the baby Jesus is added to the scene. Number of window allocations will probably be done by pulling names out of a hat unless you can’t make a particular date. This entry was posted on Sunday, November 23rd, 2014 at 9:54 am	and is filed under News. You can follow any responses to this entry through the RSS 2.0 feed. You can leave a response, or trackback from your own site.